The decision follows the dis-accreditation of the University of Canberra and the Australian National University. The ACT branch of the National Union of Students (NUS) is set to be dissolved after no universities were accredited for the 2018 calendar year, and no state branch executive was elected at the NUS National Conference, NatCon. The NUS regulations state that “a state branch is dissolved if the member organisations no longer represent at least 4,000 EFTSLs”. An EFTSL is an ‘equivalent full-time student load’, or a student undertaking 48 credit points per year. Two eligible tertiary education institutions reside in the ACT – the Australian National University (ANU) and the University of Canberra. The ANU story is slightly more complicated. The ANU Students’ Association (ANUSA) disaccredited in 2016, but voted to re-accredit earlier this year, given the NUS met a basic set of KPIs. Despite electing delegates, ANUSA chose not to go ahead with this re-accreditation (an un-re-accrediation, if you will), attending NatCon only as observers. Although there are also campuses from Charles Sturt University and the Australian Catholic University in the ACT, neither is large enough to impact the state branch enrolments. The ACU campus has just over 1000 students, while CSU has less than 1000. Outgoing ACT State Branch President Nick Douros directed Honi’s questions to the national President Sophie Johnston or General Secretary Nathan Croft. Neither responded to Honi’s request for comment (understandably, considering it is their last and busiest day in each role). 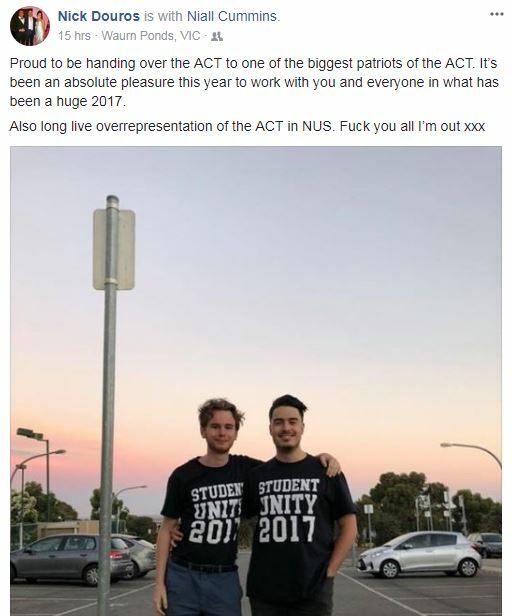 Douros wrote on Facebook: “Proud to be handing over the ACT to one of the biggest patriots of the ACT. In the post, Douros indicated that first year Unity member Niall Cummins would assume de-facto leadership of the dissolved branch. Cummins was elected as a General Member of the NUS National Executive. The UC and ANU dis-accreditations follow a turbulent period of membership of the NUS. Universities can dis-accredit, which means they remain a member but pay no fees and have no voting rights, or take the final step: disaffiliation, which completely removes them from the National Union. In 2016, the University of Wollongong Student Association (WUSA) disaffiliated, completely removing the university from the NUS through a campus referendum which passed 24-3, an underwhelming response from 33,000 eligible students. This year’s WUSA election was dominated by the NUS affiliation debate and the future of their disaffiliation remains unclear after candidates both for and against were excluded from the results. In February this year, the Tasmania University Union (TUU) State Council declared that they are similarly ‘disaffiliated’ from the NUS. The NUS Regulations state that student organisations must hold campus-wide referendums to be considered disaffiliated. This referendum is pending a decision of the TUU ‘Strategy Subcommittee’ and would be substantially more complicated than the Wollongong vote: TUU elections are run by the Tasmanian Electoral Commission. Rather than face a debate regarding NUS affiliation, other universities such as the University of Melbourne and USyd cut their affiliation fees. In 2015, the University of Melbourne Student Union (UMSU) cut theirs by 50% while the USyd SRC reduced theirs by 12.5%, despite both being in the top three ‘major contributors’ to the NUS budget. After being dissolved at last year’s NatCon, the Queensland state branch will reopen in 2018 with the inclusion of the Griffith University Nathan campus. Nathan, the second largest and oldest Griffith campus, represents 13,000 of Griffith’s total of around 50,000 students, and was previously accredited in 2016. This gives Griffith, and thus Queensland, 52 votes, the lowest of any accredited university or NUS state branch. Chelsea Bentley (Unity) was elected as QLD State Branch President, while Sofia Zeller was elected as State Education Vice President. Ed: A previous version of this article did not identify Niall Cummins as a National Executive member.